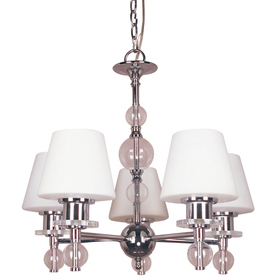 As you may remember with the dining room makeover-in-progress one of our “undone” items was the glorious chandelier. This particular light seemed a bit to fancy, but was so fun I have to admit I have looked at it several times since first spotting it. The $159.00 price tag makes it a winner as well. I am still strongly considering this one because it’s simple, yet it plays to the castle theme that The Mister would love to over indulge throughout our home. This way I could please him and keep the faux exposed brick walls and turrets at bay. Plus, it’s still under the $200.00 mark at $189.00. Now, this last one I found while looking through Lowes.com and I have to say I like it a lot too. 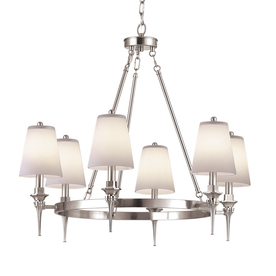 Portfolio 5-light Brushed Nickel Chandelier It’s the simplest of the three and I think it falls into the realm of “classic”…maybe? 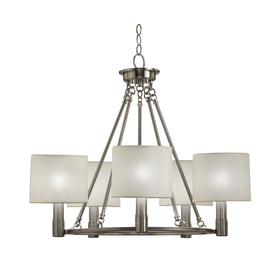 Well, with all these simple chandeliers in mind I still had my heart set on something different. Something fun and a little bit crazy. One of those décor elements that you might gasp at with the first glance and think, “ooh, that’s just wrong”, only to later decide it’s just right. I actually did just that after the installation was complete and I am still debating the new dining room light. It’s the PS Maskros ceiling light from IKEA. And, it’s only $89.00 bucks a pop! Woot to the Budget!! The only downside is that it only holds one 75 watt bulb, so we aren’t getting a lot of overhead light from this guy. However, I do plan to bring in a side piece of furniture to act as a bar and it will also hold a lamp or two. In addition, I am considering adding sconces to the far end of the room to help out with the lack of light in here. The other thing is the enormous size of the sphere. I laughed when I put this together because I had thought the old brass chandy was SO BIG, but this thing is 32 inches in diameter! I think the fact that it’s a perfect sphere makes it seem even larger. So, at this point I am undecided about keeping the light and may end up going back to one of my other, simple design choices. Unfortunately, I just recently came across this light while looking through IKEA.com/usa and I am torn all over again! AHAHAHAHAAAAHHHHHH!!! Now, I just need to make a decision and then get to work on the awful table.